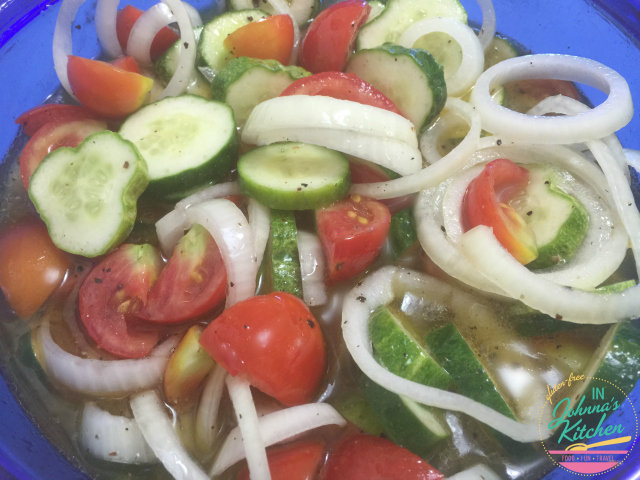 Cucumber Onion Tomato Salad, A Summer Garden Favorite! When I was a kid, some folks would keep a gallon or half gallon jar in their kitchen with cucumbers and onions in a similar dressing. I’m pretty well convinced they just kept adding cucumbers and onions to the same liquid all Summer each time it needed replenished. I’ve got no proof of this, but know that I looked forward to this lightly-pickled accompaniment to every meal…or between meals. I’ve now added tomatoes to the salad. This year we’ve got a totem tomato plant, a small, bush-style tomato plant that is in a large pot on our front step. Boy, that one plant is prolific! 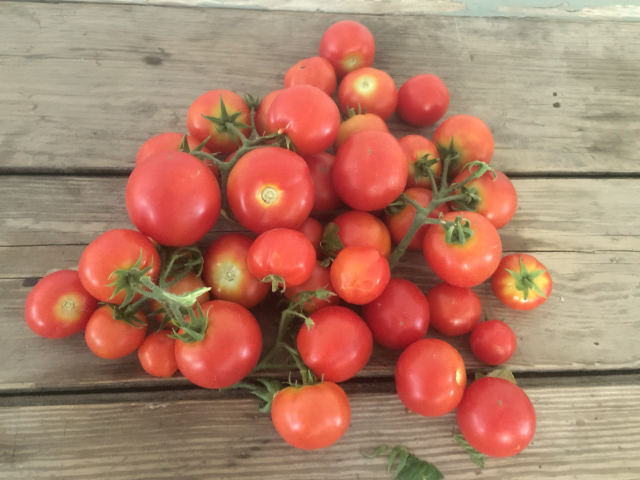 This is the harvest from one single day, with the largest tomato being about baseball size and most being closer to golf ball size. I can’t imagine it will keep producing at this rate, but for early in the season it is a real treat! Traditionally, this salad is made with white sugar. For the past few summers, I’ve replaced the sugar with honey. I like the flavor better and my body doesn’t get as puffy as it does from sugar. I’ve also tried this with coconut sugar (which is good if you need a vegan option) however it not only changes the color of the dressing to a darker one, it also deepens the sugar flavor with a slight hint of caramel. It works but I prefer honey. You’ll notice a variety of cucumbers in my photos. A friend shared Persian cucumbers, a neighbor shared some small pickling cucumbers, I had some tiny burpless ready to pick. I used them all. Six small cucumbers equaled three in this batch. 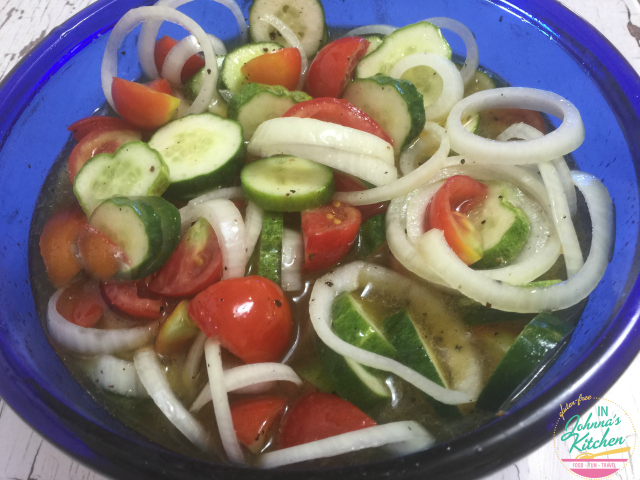 I enjoy the smaller cucumbers early in the season in this salad anyway. I leave the peel on, as these are all organically grown. If they were conventional, I might consider peeling them. The salad looks prettier to me with the peels on; that bit of green really brightens things up! Let’s move on to this recipe!